If the three House primary challengers Gov. Greg Abbott has endorsed lose their races on March 6, it won't be for a lack of trying on the governor's part. BELLAIRE — If the three House primary challengers Gov. Greg Abbott has endorsed lose their races on March 6, it won't be for a lack of trying on the governor's part. Free of serious primary opposition in his re-election campaign and sitting on a staggering $43 million war chest, Abbott has made it his main political project in recent weeks to unseat three fellow Republicans in the House who ran afoul of him last year: state Reps. Sarah Davis of West University Place, Wayne Faircloth of Galveston and Lyle Larson of San Antonio. His involvement in the races has spiked already this week, with him hitting the campaign trail for all three incumbents' opponents and going on TV in Larson's district — after previously dropping $161,000 on advertising in Davis' district. It's a remarkable degree of primary involvement by a governor and underscores his hunger for revenge after a special session last year that saw half his agenda stall in the House, where he had already been clashing with lawmakers like Davis and Larson over ethics reform. The anti-incumbent crusade brought Abbott on Tuesday evening to this affluent community outside Houston, where he rallied a boisterous crowd for Davis' opponent, Susanna Dokupil. While he spoke warmly of Dokupil, a former staffer for him when he was attorney general, Abbott grew most animated when his remarks turned to the incumbent, a moderate Republican who cuts a decisively different profile than most in her party on abortion. "Now there's nothing wrong with Sarah Davis running for state representative as long as she is honest with people in her district — telling people that she is the Democrat that she votes to be," Abbott said. "The Republican primary, the people of [House District] 134 deserve a Republican running on that ballot." Abbott went on to cast the HD-134 primary as part of a "fight for the very future of the both the Republican Party and the state of Texas," while seeking to motivate Dokupil supporters for the homestretch with talk of his deep involvement in the race. "I personally — in a wheelchair — have been block walking in House District 134," said Abbott, who was left partially paralyzed after an accident in 1984. Speaking before Abbott, Dokupil left no daylight between her and the governor, who remains the most popular statewide elected official. "Special interests out of Austin" are going to have Davis' back, Dokupil told supporters, "but the governor and I are going to have your back." Of the three incumbents in Abbott's crosshairs, Davis appears to be fighting back the hardest. With each Abbott-involved salvo, she has sought to refocus the attention on Dokupil — including just an hour before the rally was scheduled to start Tuesday evening, when Davis' campaign unveiled a TV ad tying Dokupil to several "dangerous allies." The group included "anti-vaccine radicals" — the controversial group Texans for Vaccine Choice has prioritized the race — and Attorney General Ken Paxton, who has been fighting securities fraud charges for most of his first term. On Wednesday, Abbott is scheduled to campaign for Larson's challenger, Chris Fails, in San Antonio — and for Faircloth's opponent, Mayes Middleton, in Galveston. Of the three primaries, Faircloth's House District 23 is viewed as the most winnable for the Abbott-backed candidate, Middleton, who's already poured hundreds of thousands of dollars of his own money into his campaign. Abbott has not gone on TV in Middleton's race, but the governor's campaign is spending on digital advertising for all three challengers. While Abbott's primary battles have been cheered on by some of the most conservative corners in the state, he has drawn few allies in other parts of the political arena. He has failed to persuade — or at least neutralize — a number of powerful interest groups that normally support incumbents, such as the Texas Association of Realtors and Texans for Lawsuit Reform. Both those organizations have endorsed all three of the lawmakers that Abbott is working to unseat. In recent days, the Texas House Republican Caucus has backed up some of Abbott's targets, tweeting support for Faircloth and Larson among several other incumbents facing primary opposition. In HD-134 specifically — which Democratic presidential nominee Hillary Clinton carried by 15 percentage points in 2016 — Abbott has made some fellow, already critical Republicans uneasy, worried a more conservative nominee could hand the seat to Democrats in November. Abbott dismissed those concerns Tuesday morning. "Listen, the district is blue already," Abbott told reporters in Austin, pressing the argument that its incumbent lines up more with Democrats than Republicans. Abbott made the comment after early voting with state Rep. Paul Workman of Austin, one of the incumbents whom the governor has endorsed and provided political assistance, including starring in a TV ad for him. It was also in speaking with reporters that Abbott declined to say whether he voted for three fellow GOP statewide officials: Paxton, Land Commissioner George P. Bush and Agriculture Commissioner Sid Miller. 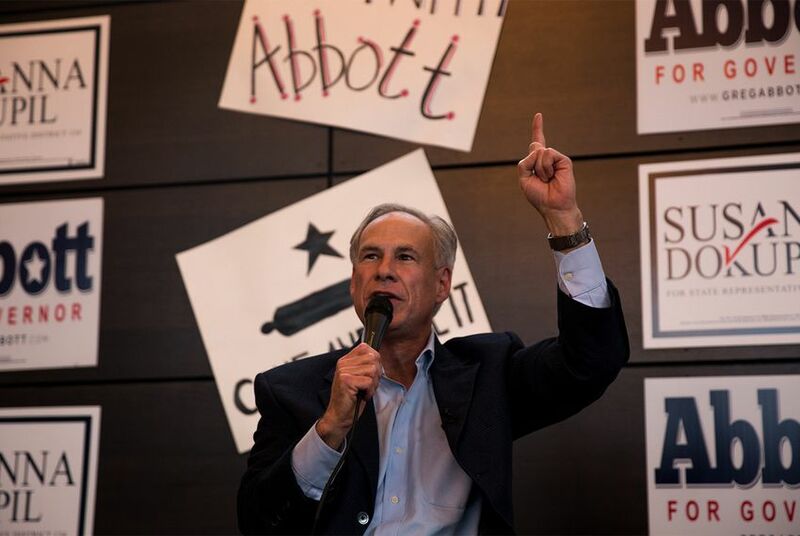 Asked how he squares his non-endorsements for the statewide officials with his fervent involvement in House primaries, Abbott did not let up on his intra-party targets. "It’s important as I go about the campaign process in some of these hotly contested races that I want to work with people in those districts to let them know exactly the challenges that I’m facing in dealing with some of these representatives," he said, "and hence the need for some changes in the Capitol." The Texas Association of Realtors, Texans for Lawsuit Reform, Paul Workman and the General Land Office have been financial supporters of The Texas Tribune, a nonprofit, nonpartisan news organization that is funded in part by donations from members, foundations and corporate sponsors. Financial supporters play no role in the Tribune's journalism. Find a complete list of them here.